Now that Thanksgiving is over, the holidays are quickly approaching. You know what that means...Christmas shopping time! In the coming weeks on the blog, I am going to be sharing with you all a list of compiled Holiday gift guides which showcase gifting ideas that I hope are helpful for you all. I know the stress of Christmas shopping can be too much to handle sometimes, so hopefully these guides will ease the experience and make your shopping endeavors enjoyable. Whether it be for your makeup loving best friend, or tech-savy brother, there is something in these guides for everyone. For this first installment, we are going to be taking a look at a few treats for those who love a little bath/skin pampering session. And to be quite frank, who doesn't? 1. Crabtree & Evelyn Winter Garden Fragranced Candle Set ($35.00): Fragrant candles have become one of the most essential items when it comes to the home. Not only are they relaxing, but the aroma imparts a lovely scent that deliciously lingers throughout the room, bringing about a warm, cozy feeling on those cold winter nights. These candles by Crabtree & Evelyn contain a fragrant medley of amaryllis, frosted apricots, and ice glazed fruits, that are sure to please. I am absolutely loving the glass holders the candles are housed in. They look so chic and glam. 2. Soap & Glory Shower Trip Set ($36.00): It's pretty difficult to resist a bath gift set, especially one that contains a super cute tote jam packed with bath and shower time essentials. In this set from Soap & Glory you will find a hand cream, shower gel, body butter, a handy shower puff, and a super cute lip gloss to boot. 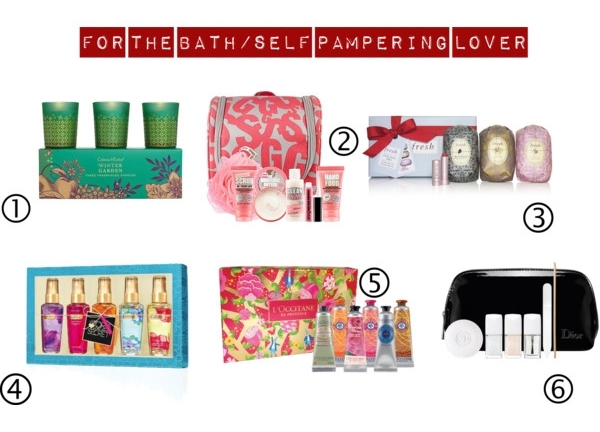 With this kit, Soap & Glory has got bath time necessities covered, and more! 3. Fresh Oval Soap Trio Set ($45.00): Solid soaps often get a bad rep for being too drying on the skin. But the soaps in this set from Fresh are infused with Shea butter, which help give the skin much needed moisture. The soaps are individually wrapped in stunning ornate paper, and topped with a pretty stone detailing-such a nice touch. Also included in the set is a mini sugar rose tinted lip treatment with SPF 15, to moisturize and protect lips while giving them a soft tint. 4. Victoria's Secret Fragrance Mist Gift Set ($18.00): Victoria's Secret sure knows how to put together holiday gift sets. The presentation is always so lovely, as are the products themselves. This fragrance mist set includes five of their most popular scents-love spell, pure seduction, aqua kiss, hello darling, and amber romance. 5: L'OCCITANE Hand Cream Bouquet ($50.00): Keeping hands moisturized is always a must. Especially in this cold, winter weather where hands are most prone to dryness. This hand cream set from L'OCCITANE contains six hand creams that are sure to do the job. The variety in the kit just gives the set a fun factor. 6. Dior Manicure Essentials Set ($62.00): There is nothing more effortless than lovely manicured nails. Dior gives you classic with this essentials set that includes a nail cream, cuticle emollient, base coat, top coat, and a wood stick all housed in a lovely patent pouch. Stay tuned for more gifting guides coming your way!